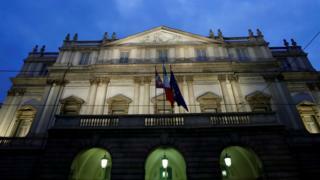 Italy's La Scala opera house is to return more than €3 million (£2.5m; $3.4m) to Saudi Arabia after a funding plan with the kingdom triggered a public backlash. Saudi Arabia's human rights record is under close scrutiny after the murder of journalist Jamal Khashoggi at the Saudi consulate in Istanbul in October. "We have unanimously decided to return the money," opera house president Giuseppe Sala, who is also the mayor of Milan, told reporters after a board meeting on Monday. "We'll go back to scratch today. We'll see if there are other opportunities for collaboration." But the plan drew widespread criticism, including from members of Italy's governing League party. League leader and deputy prime minister Matteo Salvini urged the opera house to scrap the deal while the governor of the Lombardy region, who is also a League member, demanded the opera's artistic director, Alexander Pereira, be sacked.